This is a shield-shaped Jennings Detective Agencies porcelain sign. This particular Jennings Detective Agencies sign is blue and white. 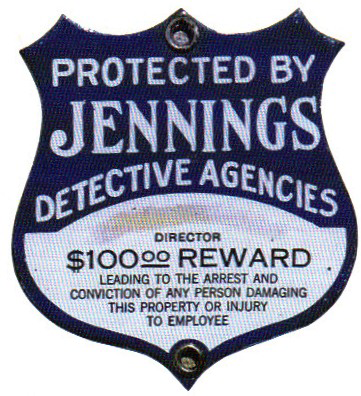 It reads, “Protected By Jennings Detective Agencies, Director, $100 Reward Leading to The Arrest and Conviction of Any Person Damaging This Property Or Injury To Employee”.